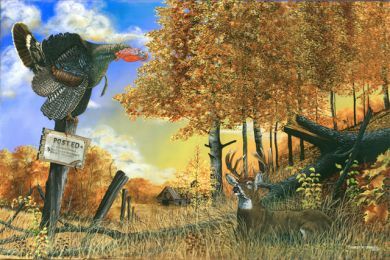 On an old abandoned Farm surrounded by thew early morning Autumn Colors, a Tom Turkey upon a leaning fence pole, stretches and gobbles an announcement of dawn. Nearby and almost below him lays a Whitetail Buck who is resting from a night of searching for and chasing Does. His moment of rest disturbed by the gobbling, produces a long hard stare before resuming his rest.